I was more than a little excited when I went over to the Mansion this afternoon with my five books from the Reading2Connect publishing company, which has created a series of book designed for older people with memory challenges. The books are exceptionally readable, yet are not patronizing. The publishers say they mean to “retain the integrity of adult literature.” That they do. 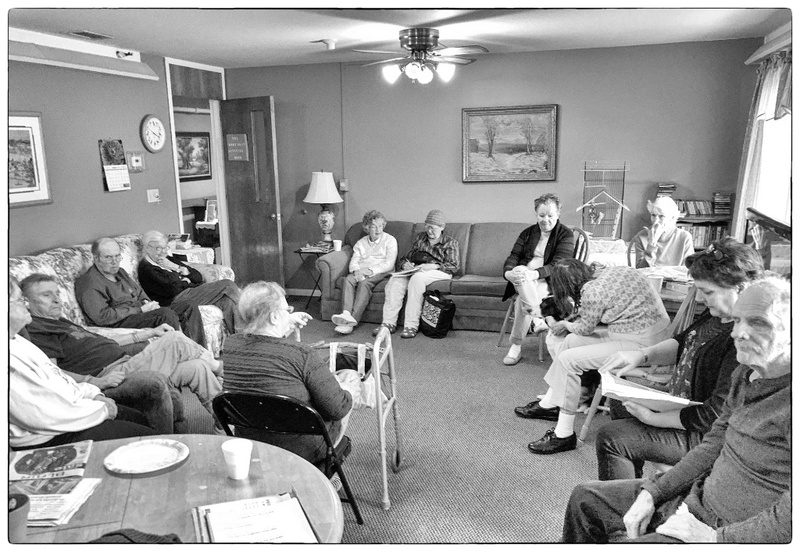 We called a meeting of residents at the Mansion, and I introduced them to the activity and reading books. They are used to reading books that are often beneath them, these books are right with them. Sometimes this group can be attentive, sometimes not. On the subject of reading, they are all eyes and ears. They were locked into what I was saying, listening carefully, eager to understand. I told them I was not aware of any complete cure for memory loss, that would be stunning news. But perhaps we could learn to use memory in different ways, exercise it a bit, give it a workout like any other exercise. I spend hour reading these books before I brought them, and I was hopeful. They were different. I read from the mission statement of the authors, Susan Ostrowski and Peter Dixon. The idea, they said, is to write books that allow older adults to independently lead and engage in reading activities by themselves or with their peers. From my first introduction of some of these books to the residents, I hoped they could become powerful tools for reviving and strengthening memory, and for helping people with memory loss regain their voice and their interest in reading. The authors were being diplomatic, much of the material given to older residents with memory care are children’s books, somewhat disguised or not. In face, people with memory loss are often treated like children. This is understandable when it works, they sometimes appear to act like children, but I am eager to see if treating their reading with more dignity and respect might help with memory and cognitive issues. There is no cure for Alzheimer’s or Dementia, that ought to be clear to everybody from the start, and I would never suggest anything else was possible. It’s not for me to say that or promise that.. I don’t do miracles or alter fate. I told the residents I wanted to offer a page or two from the book “Read Aloud Word Games” today, a kind of trial. All eyes were on me, when I read the “Complete The Proverbs Page.” I had rarely felt that degree of focus from so many of the residentsat once. Only one person in the room was dozing. I began reading from sentences like “Slow and steady wins the ___ and let the people in the room answer (race) or “Practice What You______” (preach). I was started to see how the room came so quickly to life. Seven or eight of the residents – there were 14 in the room – answered the questions right away, several others paused and answered, three of four were silent. They seemed to be elsewhere, I marked them down for one-on-one reading conversations and interactions. What I saw right away was that memory is never really, lost, it is often impossible for these older people to recall. The brain is believed to retain most memory, but over time it can no longer be accessed easily, or at all. As a test, I asked several if they could tell me what April showers bring to May. None of them answered me, they looked confused, there was silence. When I read out loud “April Showers bring May….” they all said “flowers” in unison. We went down the rest of the page quickly. They were proud and excited – and relieved I think – to know the answers so quickly, and to get to shout them out. It seemed to stimulate and focus them. They were seeing that they did have memory, and it could be stimulated, even revived to some degree. And I will be honest. I have no idea how far we can go with this. Most of the people who work with this memory loss do not believe it is possible to do too much. We’ll see. I loved the energy and pride I saw in that room today. And I believe I saw hope. I also got the Reading2Connect idea of reviving voice. The residents were not sluggish or disoriented in their voices, as they sometimes are. They were loud and clear and almost jubilant. They were laughing and eager to hear the next proverb. This in itself is healing and healthy. It sounded like pride. These books are also something the readers can hopefully eventually read themselves, without something leading them. It’s like being a parent to me, if I do my job, I won’t be necessary. These are some of the missing elements of life in assisted care, they by definition leave almost everything they love behind, as they are often left behind. After i read from the book, I showed the the other books we will be reading from Reading2Connect. The books are, in fact, subtle and indirect. They feel like conversations, not lessons or lectures. They respect the culture of the elderly rather than force the culture of children onto them. They encourage interaction with one another. This is just the first lesson, it exceeded my expectations. I am quite excited by what i saw in the eyes and faces of the residents. Their minds were churning, they were awake in every sense of the word. So just about every hand went up when I asked if they wanted more lessons, in a group or one-on-one. Madeline is in her 90’s, she has memory issues but is intelligent and aware. She never joins group activities, she is fiercely independent, but her hand shot up right away when I asked who wanted to work with me on reading and memory. She said she would love to be part of a group lesson. I scheduled the first lessons for February 7. We’ll schedule more after that. I want some of the residents to read the books to me. I am grateful to Susan Ostrowski and Peter Dixon, they are onto something that could touch the lives of many people, whose potential and creativity has often been abandoned and left to wither and die. Like them, their memory feels left behind. Memory is life, the more we can use and more we can keep, the richer and fuller our lives. I saw glimmers of that today. We’ll see where it goes. I’m going to order more books. If you wish to help, you can donate to Jon Katz, P.O. Box 205, Cambridge, N.Y., 12816, or via Paypal, jon@bedlamfarm.com. And thanks. Gus and Fate are our own Odd Couple. I think Fate needed a Gus here, the two play with one another all day, growing, hiding, stealing each other’s toys, chasing each other around the yard. 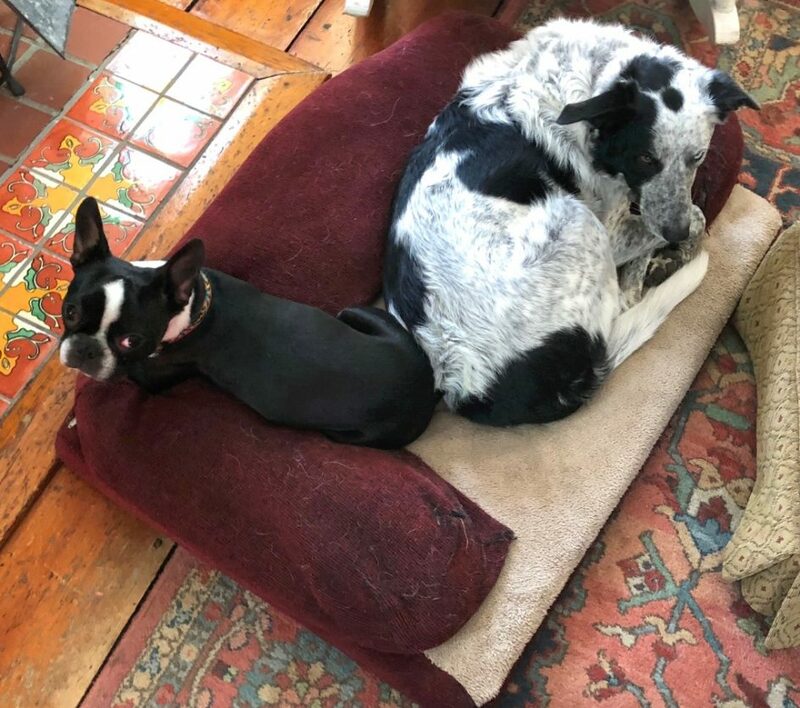 On cold days, they both curl up together on Fate’s dog bed in front of the wood stove fire. I call Fate Satan’s Spawn because she is incorrigible and is a natural denier of commands escape artist. Gus is doing well, as long as we don’t let him in the pasture or the woods without a muzzle. We strictly regulate what he eats, and the more we control it, the better he does. Some days there are no accidents, some days one or two. But we are in a kind of holding pattern, I don’t think it’s going to get away, but so far, it isn’t getting worse. He is a happy, active and much loved dog. We can live with it, and so can see. He did start vomit once in the bed last night, but we got him off the quilt before he threw up on it. I am already getting used to things i did not think I would get used to. The specialists at the Retinal Consultants outside of Albany, N. Y., Maria and I got up early – she was good enough to drive me as I had been warned my eyes would be so heavily and powerfully dilated that it would not be safe to drive. I really hate it when she has to miss any of her work to drive my anywhere, but she pooh-poohs that as just life. I suppose it is. It was frightening for me to notice one day that when I tried to read, the top half of all the letters were missing or blurred. I thought about my photography, my blog, my reading. The doctors were grim and alarmed. So was I. 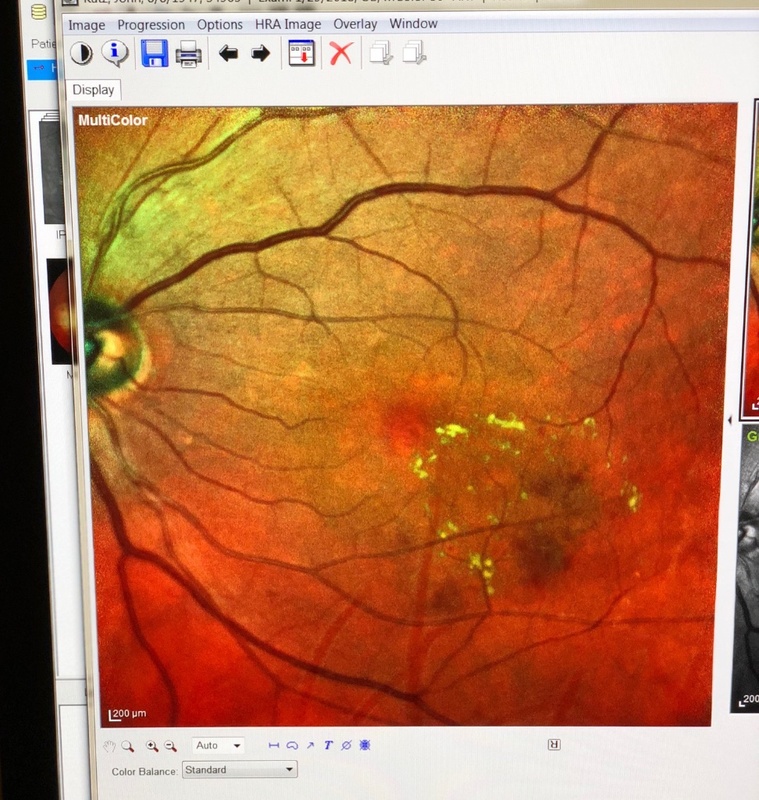 The good news was that the swelling – you can see the aneurysms (yellow dots surrounding) above. That is the dangerous part. Thanks to the potent eye drops I’ve been taking, the swelling has shrunk and moved away from the retina (the octopus like orb on the left.) But it’s still there. I was at the doctor’s for more than three hours, and was much relieved to learn that my eyesight is excellent. I am also relieved to know this is treatable, which it wasn’t until fairly recently. I don’t need regular injections into the eye itself, as was first thought, they recommended laser surgery next Monday. They said I should be fine, at least for now, they are using lasers to create a grid around the aneurysms so that they can’t spread. They don’t like swelling anywhere near the retina. I have been anxious about this new issue in my life, I wanted to put it behind me, I’ve have six or seven trip to the eye doctors and I wasn’t sure where it was going. I was mesmerized by the photographs they took of my eye and put up on a big computer screen. The techs were surprised, but happy to comply when I got excited and asked to take a photo of my eye with the Iphone X, they were happy to accommodate me. I e-mailed the above photo to my daughter, who messaged me right away: “gross but beautiful.” Maria, ever the artist, loved the lines. She is nothing if not direct. The photos of my eye were quite mysterious to me, the arteries and deep red color. I actually found the pictures of my eye quite beautiful and mystical. When I started the blog, I promised to be open and share my life, so here you go. You even get to see the inside of my eye. I’m not kidding about the blog being a living memoir. It is all of the small parts that make up a life. The laser surgery is not a big deal, it is painless, takes no more than 10 minutes, and I can go back to work right away, unless my pupils are dilated again and I am peeing more bright yellow streams. While I’m at it, I haven’t mentioned the voluntary subscription payment program for months, As the economy soars, I feel better about asking people to consider paying me for my work, if it is meaningful to them. You can cancel any time and no one controls your account and your money but you. If you don’t have the money or wish to spend it, the blog is free and will remain free. Please think about helping to support my blog and my work it is expensive to maintain the blog and the photography. Thanks. If you prefer, you can also send a one-time donation in any amount you wish, just click on the yellow button below this post or any post. Do Revolutionaries Live Too Long? During the Qing Dynasty in China (1644-1911), a prosperous merchant surnamed Hunag built an imposing sixteen bedroom house in China’s southeaster region, calling his home Yin Yu Tang. The Peabody-Essex Museum spent millions of dollars moving the house from China to the museum in Salem, Mass. where it has been lovingly re-assembled and draws visitors from all over the world. Maria and I saw this house on Sunday, it was fascinating to see, I was especially struck by the posters of Mao and the Red Army that were up in various rooms throughout the house. There are at least three historical figures that have fascinated me my whole life – Thomas Paine, Mao and Winston Churchill. I read everything i can find about them. Mao is in a category all by himself in many ways. Historians say he murdered more people in his lifetime than either Hitler or Stalin, the other two well-documented monsters of the last century. He also broke the power of the rich clans who controlled much of the land, brought women into education and politics, advocated near universal health care for peasants, and set the stage for the amazing transformation of China after his death. Reading my history books has always led me to believe that political leaders and despots live far too long, they often start out with idealistic and noble arteries and so often turn to pure evil, the older they get, the more murderous and frightening they can become. 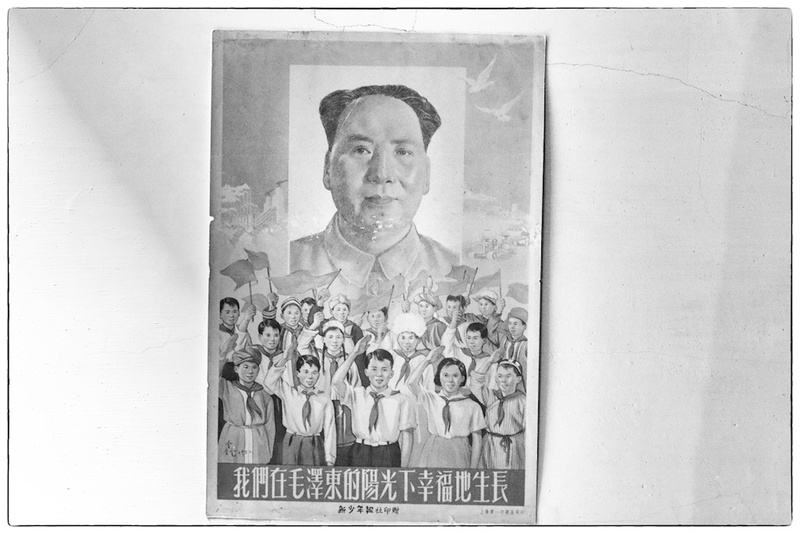 Mao is till revered by most Chinese people, who worship him as a savior and liberator. His pull on the imagination of people everywhere is still strong. I have never really figured him out, or read anything that helped me to completely figure him out. I think he is unknowable to the outside world. Some of his own early writings are powerful and revealing. So I was startled to see him hanging on the bedroom walls in this meticulously restored rich man’s house in a museum in Salem, Mass. I wanted to say hello, and ask him a few questions, and he triggered a flood of memory. I once worked for a brilliant journalist named Harrison Salisbury when I got my first job in journalism as a copy boy for the New York Times. More than any person I have ever known, I wanted to be Salisbury, a fearless, elegant and aloof reporter from a time when journalists did much more than shout at one another on cable news, or troll Twitter for story ideas. The sad thing is that most people living today will never know what they are missing. Salisbury was the first American correspondent in Moscow after World War II and he walked with Mao on the Long March across China that led to the great revolution and changed the course of world history. If Salisbury even noticed me, I would be surprised. I got him coffee and ferried his copy to the news desk, when he typed a page, he would simply hold it up in the air, and God help me or any other copy boy if he had to wait more than 10 seconds for me to come get it. I wanted to be him so badly I still sometimes cry when I think of it, his reporting and intellect were both unlike anything I had ever seen, then or now, and I thought of him when I saw Mao’s posters in the Yin Yu Tang House. I rushed online this morning and ordered his great book ‘The Long March” about Mao’s famed march to revolutionary triumph and glory. I lost my dog-eared copy years ago and I can’t wait to read it again. Salisbury also wrote perhaps the greatest account of the horrible siege of Stalingrad towards the end of World War II. Salisbury was a major reason I left the New York Times to take a job as a reporter at the Atlantic City Press, where I felt so much more comfortable. I didn’t belong at the Times. Later on, I realized that one reason I left the paper was that I knew I could never be him or anyone like him. And I was right, I’m not. I’m glad I didn’t waste my life trying. It was a fascinating convergence of things for me in Salem, a place of spirits – memories, yearnings, history and a kind of curiosity that can never be fulfilled.